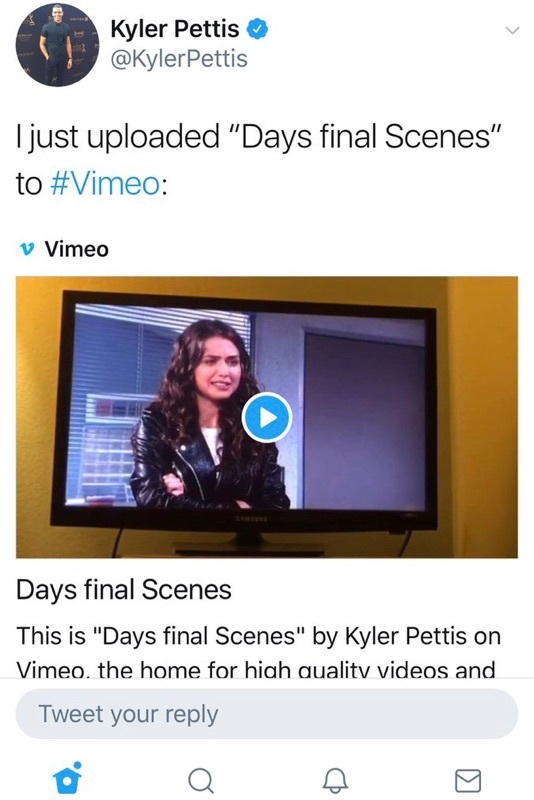 Kyler Pettis inadvertently announced his Days of Our Lives departure as Theo Carver, when he posted his final scenes on his Vimeo account and tweeted it with a link Tuesday. The 24 year-old actor’s video was quickly made private and then deleted from his account shortly thereafter. The video is now posted and widely available on the internet in various Days websites and Facebook groups, so we feel compelled to report the news to you, dear Soap Cities readers. Pettis’ exit follows the recent on-screen departure of fellow co-star James Lastovic, who played fellow teen Joey Johnson on the show. Related: More Additions to the Days Cast! The screenshots of his final scenes confirmed by Jason47’s Days Website below, also reveal the recast of Ciara Brady, now being played by Victoria Konefal. The video includes emotional goodbyes with Claire (Olivia Rose Keegan) and Ciara. It also includes the reveal that Theo is going to be an uncle! This leads us to believe his sister Lani Price (Sal Stowers) will be pregnant, but by whom?? Theo also reveals he will be gone from Salem for a year. Also: NBC Gives Days a Big Vote of Confidence! Related: Read About the Casting of Ciara Brady Here! The character of Theo was aged less than two years ago during the 50th Anniversary of Days when Pettis replaced Terrell Ransom, Jr. in the role. Theo is the son of the late Dr. Lexie Carver and Salem Police Commissioner Abe Carver. He was part of the SORAS’ed teen scene along with Claire Brady, Ciara Brady, Chase Jennings (ex-Jonathon McClendon) and Joey Johnson. With the show taping six months in advance, we can expect to see these goodbye scenes with Pettis sometime early next year. So dear readers, what do you think about Pettis’ departure as Theo from the show? Will he be missed or should he be recast? Give us your input in the comment section below. Check back with Soap Cities for more Days spoilers, recaps, news, and fun! Follow us on Twitter at @soapcities, on Instagram at @soapcities, and come chat with us in our Facebook group. Catch Days of Our Lives weekdays on NBC. If you want more soap action 24/7, go to Soap Fans United! Previous ArticleBREAKING: Victoria Konefal Cast on Days as Ciara Brady! Next Article Days of Our Lives Spoilers, Thursday, August 24th: Brady Dishes With Victor! Keep the character, get rib of Abe and Brady! No way. Abe has been there ever since the 80s when I started to watch this show. There is history there. Theo can go for a year and return or be recast later. I hope to see more scenes with Chloe. And Brady character is so awesome!!!!! wth… lol. But 2018 is full of surprises. So glad Viviane is back. She is a good villainess and we need one back in Days right now. Agree, Abe and Brady can leave. I’ve been watching since the 80’s myself, but I’ve never cared for Abe’s character, annoying if anything, and Brady has gotten to the point of annoyance as well, and it has been lingering for too long. I miss the old Brady. Flaws on people’s characters is not a bad thing, as it gives storylines, but this one has been burnt beyond. i agree!!!! i love him as Theo! Why are they getting rid of most of the teenage recast now. What’s going on? I’ve been watching Days since it began. I miss the Days of romance. Remember those days? I agree….no recast and bring him back. How about the treatment is so successful he can return in 6 months!!! Please keep Tyler Pettis. He is a fantastic actor. Have him return after his rehabilitation. It would be wonderful to have this same young man play the role of Theo,but we don’t always get what we want, so by all means recast him and in the mean time get the rid of Claire She’s so annoying. Please let Land tell the right father the baby news. Thank you. No do not recast him bring him back . . . . I hate to see him recast because I can’t believe that anyone else will give the beautiful, sensitive portrayal of Theo that Kyler has. But, I don’t want to see Theo’s character go, so I would like to see it recast! I agree. The current Theo is great; bring him back! Theo needs to be the same Theo always. Recasting him would destroy the character. I get taking a break but nobody else can play Theo the way he does. Keep Theo, and in a year bring him back. Kyler is great as Theo he’s made the part his. We have lost so many good actors lately it’s time that it’s enough. what if he wants to leave?, is it his decision or yours? I agree. Please please bring Kyler back as Theo. He is and has been the best teen actor on the show. I will miss him. Kyler is my favorite character on this now ridiculous show. I hope that he is leaving on his own accord and that if this damn show ever gets real, he will return. Pleasr do not get rid of Theo, there has been to many bring back the dead and psychopaths this season. You are not just getting rid of Theo but altering so many others lives. Enough is Enough. Please git rid of Kate and Brady. what is he wants do decide to leave the show? ,is it your decision of his? I agree. Bring him back later. Kyler is great in this roll. I agree. Just please do not kill him off and then want to bring him back. Enough with the dead coming back to this soap. i want to know when Bo will come back from the dead….again. And the real Stephano Dimera. It’s going to happen. I kinda want to know what is gonna happen now that Will is brought back from the dead. I was getting used to him being dead. Not sure if I want to see Will & Paul together. Thats boring. The real Stefano DiMera played by Joseph Mascolo died in 2016, so cannot bring his character back because no one could EVER play that part as wonderfully as he did. In my humble opinion. I still say keep Kaylor and bring him back in a year. He plays Theo wonderful. Great actor. Hate to see him leave, great actor, played the part of Theo so good. He will be missed. Hope that he will come back to continue this role. NO!!! Stop letting them go! Theo is awesome and Kyle is perfect for the role! PLEASE bring him back!! He is definitely one of the characters I hate to see go. This young man is excellent at portraying Theo I hope the executives and the writers have a change of heart and leave things as they are or just have him on a short hiatus. Just love Kyler as Theo, what a great actor and so believable. Would not like to see him recast, hope he will be brought back in the year as suggested. His character is so special. And he does a great job. Big mistake Days! Theo is fantastic! Kyler is a great actor- so natural. Just take a look at his crying scene before his exit. No one could do it better. PLEASE bring him back and DO NOT recast !! I love this Theo! Please bring the same actor back! He IS Theo! Bring Kyle back as Theo…. I am tired of all the changes….its a revolving door of characters. Kyle is a very good actor. Please keep him on Day’s as Theo. Guys , if Kyler wants to leave the show then that’s his decision, ‘NOT!!! !” yours, I totally understand that you guys likes him as Theo but if he wants to leave, then there’s “NOTHING!!! !” we can do about it, cause it’s HIS!!!! decision, not yours or mine, it’s “HIS” so can you guys please let this guy live his life and move on? gosh. sick and tired of seeing all these “let Kyler keeping playing Theo when he gets back comments” let this men live his life for heaven’s sake. not everybody every actor or actress is going to last in Days forever you know?, some of the characters are gonna leave Salem and some of them are going be “KILLED!!! !” off. that happens in ALOT!!! of daily drama series. The question was asked and fans have answered… we all love the role Kyle Pettis has played as Theo Carver and would Love to see him come back. No need to have a meltdown because of this. It is understood that when an actor chooses to move on, it is their choice to do so, but given the option to come back when they’re ready, and giving the fans a choice if they want them back or replaced, we, the fans, are voicing our opinion that we would Love to have him come back instead of replaced. Can you live with that? Yes Yes you are right. I have been watching days for many many years. Yes I am sadden to see Kyler leave the show as well as many others that have left the show. But we have to remember that this is a job to these actors and they sometimes want move on to do other things, just as you and i do every day. Some of these actors are not going to stay for ever. I am sadden to see him go, but wish him well, Where ever life takes him he will do well. Hoping to see him on other shows. Days producers and writers please recast…..Kyler continue to following dreams. Yes Yes you are right. I have been watching days for many many years. Yes I am sadden to see Kyler leave the show as well as many others that have left the show. But we have to remember that this is a job to these actors and they sometimes want move on to do other things, just as you and i do every day. Some of these actors are not going to stay for ever. I am sadden to see him go, but wish him well, Where ever life takes him he will do well. Hoping to see him on other shows. Days producers and writers please recast…..Kyler continue to following your dreams. Where did you read that it’s His decision? Is this just your interpretation? Heinrich, you keep melting over this. Lighten up. We can not assume that it’s always their decision, as it’s been done before that sometimes they do let them go, and not always their choice to leave. Case in point, Shawn Christian. You have it right, if an actor wants to leave and try something else, by all means, it’s their right, but when we, the fans, are asked what results we’d like to see about the possibility to recast or wait for a possibility of return, we give our opinions as we feel them. Upon reading the article, it seems to me that there is a posibility that Kyler Pettis needs some time off days but if his role is still open, he is considering returning. That was my understanding from what I read, but it wasn’t necessary specific. If that is the case, I can see why a lot of us are saying that we’d rather wait for him to be ready to return, rather than to have him recast. If he doesn’t want to return, then we can support him on his decision and wish him well. Kyler WANTED to stay! It was DOOL that made this decision! That was the report when this news first came out. In fact if I remember correctly, he was shocked by the decision. I too, hope they bring him back and not recast him. Please keep the role open for K. Pettis….. he owns it!! But if he wants to leave the show then that’s HIS decision and not ours and we have to deal with it. It might be a money issue. If the show see’s all fan reactions maybe they would up his salary? hopefully! Kyle you have done an amazing job with your role as Theo. You will be greatly missed! Please bring him back. I love this young man. He can’t be replaced at all. So please don’t try to replace him. If you have to pay him more money then do it!! He’s GREAT!!! I wouldn’t be surprised if the character of Theo is off screen just for a bit.This wouldn’t be the first time Days writes a character off temporarily because they need to move other things along and they can’t do it while that character is onscreen.For example while Theo is off screen maybe Claire and Tripp start getting together and then just as they do Theo returns.So i wouldn’t be surprised if the show brings Theo back sooner rather than later but whether it’s Kyler Pettis or a new actor playing him is to be determined. I think Theo Carver should stay and he should come out of his come soon and reveal that Kate is the one that is responsible for him being shot and in a coma. please keep Kyler Pettis as Theo….love him as that character….don’t let him leave please…He is a great actor…makes his lines believeable…. Stop. Bring back the character of Theo whether he has to be recasted or hopefully same actor. So sick of killing off people or bringing them back to life. You may be losing viewers if this continues. I’m not sure that I agree that killed characters keep coming back. Many ppl return like Austin and Carrie and Sami and Belle and Shawn and Phillip but none of them were killed off. So Theo is luckily not being killed off. Joey also was not killed off just sent to prison. So bringing characters back is more realistic that way. But once in a while characters have to die. I think it’s great when characters can come back from the dead and spruce up some storylines… It’s a soap opera. That happens here. Lol…Good luck to Kyle. Claire & Tripp will be better than Theo & Claire…but I think Claire should be written off. Hope Nicole comes back at some point!!! I agree with the comments that you should simply replace him. too many other characters depend on his story line continuing. Recast him so he can be brought back later. Hes such a sweet kid. Why does the cast have to keep going through so many changes. We just get to love them , then there gone. Keep theo and do not recast. Send him to a hospital till he heals fully. Then bring him back. Please keep Theo on! Now that he”should come out of his coma, he should stay. Quick question, does he know about the love from Ciara, that Claire hid? Just wondering. Please keep Theo!!! Plz don’t recast him, this Theo is so sweet and kind he is so loyal and honest!!!! We Love this Theo!!!!! Hmmm…everyone here loves Kyler as Theo. There is not one person who said the role can be recast…Is this site rigged in Kyler’s favour? I hope the moderators are not biased. In Salem teens should play young and vulnerable. Kyle pulled it off perfectly – played a well functioning autistic college teen. Why fire all these teens that are developing into wonderful characters? GIVE THEM A CHANCE! You are instead bringing back way too many “over 55’s” returning to Salem. I enjoyed the freshness of the teen stories. I miss Joey. The Joey and Jade story had promise. And so did Chase. Why did Chase have to become such a creep then sent away? He was sweet once and believable as Ciara’s good friend.. The Ciara triangle with Claire and Theo seemed very authentic. It happens in real life. Why don’t you want to see innocent authentic teens? Days seems to fire these young actors and replace their character with 30ish actors like the new Ciara and Tripp. Neither look college age. If you wanted to invent a Tripp character to be Steve’s son , , Tripp should have arrived to Salem as a new doctor to replace Bo (he looks the age for it). Tripp does NOT fit well with sweet Claire. Claire’s character should be developed more age appropriately. Whatever happened to Chloe helping to make Claire a teen singing sensation? I’m hoping now that Chloe’s back in Salem, Claire will dive deep into her singing career with the kind help of Chloe and make it BIG. Claire WILL WAIT for her Theo (played by Kyle) to return to Salem. Why not have them get married when Kyle returns. They could start a family as teen parents but after Claire’s career has become established thanks to Chloe. Make Kyle’s and Olivia’s love story a beautiful one. In my reply above, sorry for writing Kyle when I meant Kyler. Should NOT have let Kyler go. Bring HIM back. I’d like to know if Kyler left on his own accord or did Days fire him? I sure hope they didn’t fire him. He did a great job as Theo. He is a talented young actor whom I will miss. I hope he stays on and like to see Joey would come back. Omg. I have never liked a young actor as much as Kyler. As Theo, he was absolutely great. I loved him as if he was my own flesh and blood son. The other day when they said Theo would have go to Africa for year I cried. I have never inquired about an actor leaving. I didn’t know it was his decision. All I know is this young man is an awesome actor and I would love to see him again when and if he decides to come back on days or wherever.He is just a young great actor.God bless you young man. You are one talented actor. Keep studying to be the best you can be. Love you. KYLER! . I would love to see him return after his year of rehab. Kyler plays this part so well. Cant imagine anyone else being Theo. Get him some better acting coach and give him another shot, if that doesn’t work then recast him. On today’s show, Abe told Theo he will be okay in Africa because family will be with him, including his grandmother. I must have missed this. Who is Abe referring to? Who will be in Africa with Theo? Does anyone know the answer? Please bring back Kyler Pettis, no one else could play his part like him it was like he was made to play that role. If someone else came back in his place I would be really upset as a long time watching Days Of Our Lives fan. I’d like to see Lonnie leave. Terrible actress!!! You can recast if you find someone who can do the job Kyler did. I really like the new Ciara. She has done an excellent job. I wish you had a new Belle. She is too whiny and skinny. Keep Theo!! He’s one of the best actors on dool. He also plays his part so well. Get rid of Claire, she’s annoying. I’ve watched dool for over 50 years and the episode with JJ Compton plating suicide, what is the best and most dramatic episode in a very long time. Bring Kyle back as Theo. It’s as if this role was made for him. I think you should bring him back and not recast hid role. Abigail Devereaux Dimeira on the other hand is a little homely old fashion looking. She’s not classy for Chad Dimeira. I think you should bring back. Kate Mansi, the one who played Abigail before her. She is more classy and she fits better with Chad. Can’t believe days is getting rid of one of the better actors on that show. What a shame. I would love see him come back after 1 year of rehab. Kyler is a great actor and nobody else can play the part of Theo Carver but Kyler. Keep him he portrays the character very well and puts much needed information out there so people who don’t have any one in their family with autism may understand it better. If this was not by choice, Days writers/casting are crazy. This young man is probably one of the most believable actors on the show. Stop bringing back all the old fogies that had their time. Bring Theo and Joey back!!!! Days is starting to get stale. Please bring Kyler Pettis back as Theo! He is an incredible actor and the character Theo is adored! Theo should return and Kyler should play the role! On a side note, why have the writers made Brady’s character so stupid? Please Bring Kyler back as Theo. He’s such a great actor and plays his role well. If someone needs to leave, get rid of Eve! Make sure to bring back the same Theo. You only have a few blacks on the show. Theo played his role to the T. Do not have anyone to replace him. Just bring him back. Have a little consistency on the show. He was mature and intelligent in his role as a person with a disability. Whatever the reason was that he had to leave for a year. In a year please recast him. Not another peson playing his part, but HIM. Bonnie how could the site be rigged? You commented didn’t you? Were your comment rigged? Name one teen that acted as professional as this young man did playing Theo. Name one that made his character believable. Name one that wasn’t wild and outrageous and unpredictable. There is none. His position should be saved until he returns. Have emails read from him or letters but never let him be recast. Only this character can give Theo justice. I also agreed with another reader who said we need to keep these youngerteens. It may cause more younger teens to watch and keep the ratings going. For God sake, the writers need to let Hope finally get and keep a man since it seems that they just don’t want to bring Bo (Peter Reckell) back. Add some happiness to the story. Everybody shouldn’t always be in constant turmoil. Add some happy scenes once in a while. The black cloud does not always have to be over Salem. Get with life!!! Let some teen be successful. Have a teen attend and complete college. Let a teen make a difference in the lives of peple from Salem. Let one save a life. Lett Abby be strong for once. Stop making her a weak person. Have her a powerful person in the company. Let her and Chad be a powerful couple. And enough of the sorry, pitiful JJ. New story line for him please. Now enough of my soap box…. Tyler is a wonderful young actor and played the part of Theo so wel! I hope they don’t recast and bring back Tyler. He will be missed!! Keep him or bring him back! I think Kyler plays that character perfectly and should he come back, should not be recast. I am patiently waiting for Arianna Zucker (Nicole) to come back. Kyler is Theo. They should never have let him go. Bring him back. I could do without some of these older characters being brought back from the dead are brought back to cause old chaos. Keep Abe, Brady, Kyler as Theo, and bring back Bo and Billie. I’ve been watching Days since the beginning. It’s flat without Bo and Billie was great with him. Never liked Hope. Get ride of this Ciara and Claire. They are 2 of the most spoiled, childish characters. No personality. Just childish senseless drama. All had great storylines. The show rocked with them. These newer characters, not so much.